It's obvious that I haven't been running enough -- but the long long days in the office have really sapped my strength. So very little running happened this week, and only one run last weekend. So I decided that I really needed to get some miles done. Friday we got home too late, but on Saturday, Wil woke up early, made us some breakfast (bagel and cheese for me, bagel and peanut butter and Marmite for Wil), and we went out for our short run. Wil needed to pick up a package at the post office depot, so we plotted out distance that would take us from our house to Fremont and back along the Burke Gilman, dropping us at the post office at the 4.25 mile point. 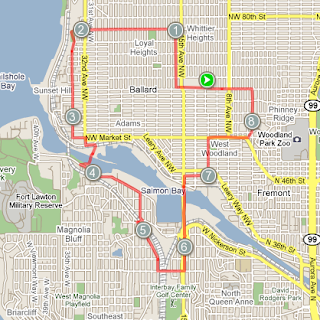 So a smooth run down to Fremont, a turnaround near the Aurora Bridge (where we saw the workers installing the jumper net), and then back to the post office. It was a pretty easy run, though Wil had us going at a faster-than-normal pace. So that was one run finished. We had our friends Rebecca, Eric, and Meg over for a Beatles Rock Band party on Saturday night -- may I point out that my arms are tired? Too much drumming. :) Wil woke up with a banging headache (umm, too much drumming?) but I was bound and determined to do the long run. I had plotted out a 8.5 mile course (that left time for warmup and cooldown), so I didn't have too much thinking to do. Just get up, eat some leftover quinoa salad, fill up my camelbak, and decide what to wear. The weather this morning was strange -- sunshine, but a very brisk and cold wind was blowing. So I compromised -- tri shorts and a long sleeved top. Perhaps not the best choice -- I got too hot about halfway into the run. Should have had a layer to strip down to. But I ran up to the lookout, then down down down to the locks, across the locks and up to the lower edge of Magnolia, then back along Dravus and across the Ballard Bridge. The breeze I was running into going up the hill to the lookout was even stronger here; it was so strong that I felt I needed to lean into it to move forward, but when it lessened between gusts I lurched forward. But I made it across (after pinning myself to the railing when a bike squeezed past me at the narrowest point) and then I was in the home stretch. I ran up 14th to Market, crossing at the light (to avoid having angry drivers speeding up and then slamming on their brakes to "teach us a lesson" about crossing at crosswalks...), and then along Market up to 3rd. By this point I was walking more than I wanted to -- basically up the hill from 8th to 3rd. But then I ran along 3rd to 65th, and then down the hill (jolting my less than thrilled knees with every step) and stopping at 8th for a cooldown walk. I'm feeling very tired from the first true back to back runs I've done in a while. But Wil and I both agreed that trying to get the first run in on a Friday night probably isn't going to work out for us. So we're going to have to shift our training to Tuedsay, Thursday, Saturday, Sunday. Which probably makes more sense anyway. Way to get out there and run! Next time give me a heads up that you are running past my place and I will set up a water and gu station for you. Wow, you are a superstar! That's a big run after a long night of drumming! Brava!